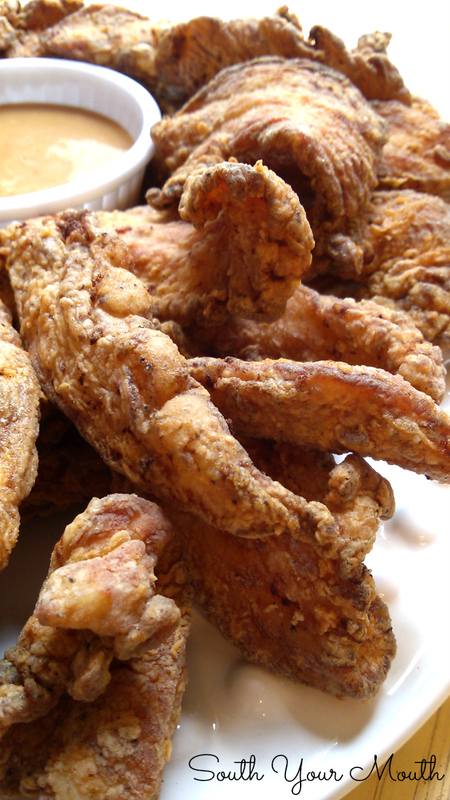 Lightly breaded Calabash chicken strips fried crispy and light. Plus a recipe for Chick-fil-A Sauce! Before I tell you about the recipe, I have to tell you about this old man eyeballing me and the chicken while I snapped some photos for y’all. I bout cried when I saw that he had crept in right beside me, trying to get closer to the delicious smelling chicken because a week ago he wasn't eating and I thought I was going to lose him. This old man is Hondo. We got him when he was about four years old (and already named) and have had him eight years. I've had dogs my whole life. I've loved some more than others. But I've never loved one more than this one. He’s family. Onto the chicken! “Calabash” refers to a method of frying something with just a light dusting of breader rather than a heavy batter. It originated in Calabash, NC as a way of preparing shrimp and other seafood (but mostly shrimp). Some recipes use flour, some use cornmeal and some use a mixture of both but almost all of them will be heavy on black pepper and call for marinating the protein in milk or buttermilk. We have a restaurant chain here in the Carolinas and Georgia called Fatz Café that has perfected the art of calabash fried chicken (seriously, it’s sooooo goooooood!) so I set out to recreate it this weekend. I used whole boneless, skinless breasts and then cut them into thin strips to mimic the size of the shrimp that put “calabash style” frying on the map but feel free to use chicken breast tenderloins or, of course, shrimp! Cut breasts into strips about 3/4-inch wide and add to a medium bowl or large zip-top plastic bag. Combine milk, hot sauce, salt and pepper in a small bowl and stir until salt is dissolved. Add to chicken, stir, cover tightly or seal, refrigerate and marinate 12-18 hours. Drain all marinade from the chicken; set chicken aside. Heat 4 inches of oil in a large pot to 350 degrees. Combine flour with cornmeal salt, pepper and spices in a large paper bag or lidded container. Add 1/3 of the chicken to the breader mixture, fold bag or seal container tightly and shake vigorously to coat the chicken. Shake off any excess breader and fry chicken in batches (don’t overcrowd the pan) until golden brown and crispy. Serve with your favorite dipping sauce. 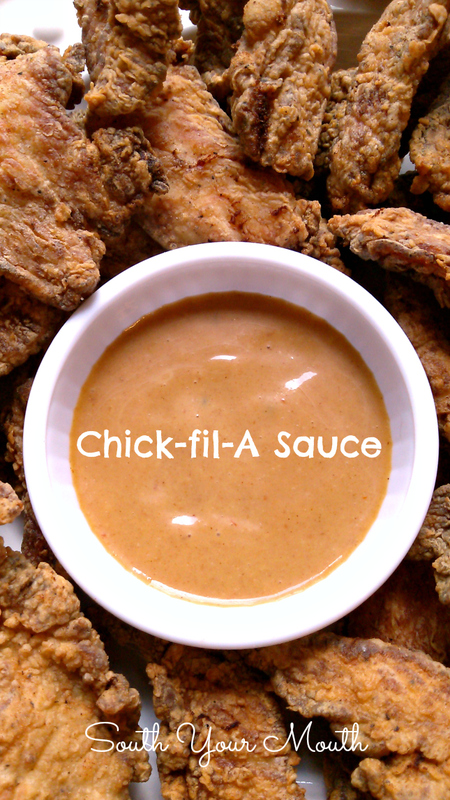 See below for my version of Chick-fil-A Sauce! *Substitute buttermilk and omit hot sauce if desired. Buttermilk AND hot sauce will be too acidic to marinate the chicken this long. The hot sauce does NOT make this spicy. Mix ingredients together and serve with your favorite chicken strips or chicken nuggets. Sounds just like my little Miles. He was sick when we got him and lived on poached chicken forever. Now, when you say the word chicken his little head whips around like you just announced the most important fact of his life. Cracks us up. He is family too. I nursed him through so much in his four years, he's my little hippy dude! One cool cat, oops, dog... life wouldn't be the same with out him. He's not no dog, he's a peoples. So so so glad Hondo is better. (hugs) to Hondo! Love your recipes too! (hugs) to you! Chicken looks good and I'm glad Hondo rebounded back. 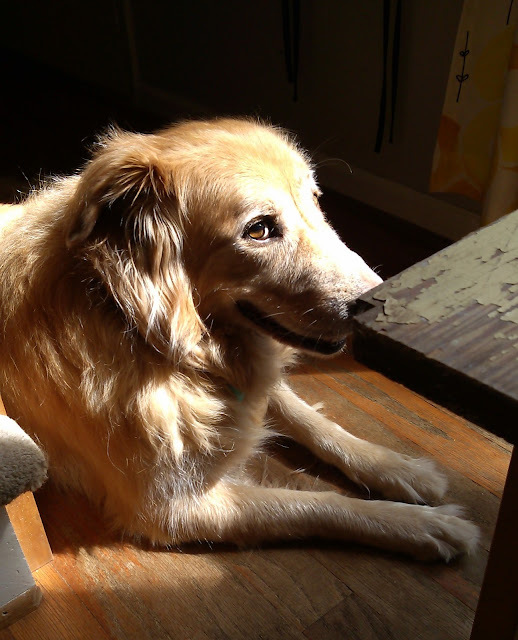 I lost my 18 year old mixed dog last May. Not a typo, she was 18 and we loved her so much. She had a couple of bad bouts too, but we managed to get her thru it until the day I had to let her go. I've been looking at your site for a while. Love your recipes. So glad Hondo is feeling better! And the recipe sounds DELICIOUS! Can hardly wait to make it! This sounds awesome. I love fried chicken. Thanks for sharing. I love Calabash! I grew up not far from there and go back every chance I get for some good food. I'll try your chicken, it sounds wonderful! Hondo is a handsome boy ~glad he is on the mend. Looking fwd to trying this recipe. I love your recipes - they bring back such warm memories from growing up in Mississippi. I also enjoy reading your commentary. Thanks for sharing photos of Hondo - I have a yellow lab that sticks pretty close to anyone who is rustling around in the kitchen. looks divine! and that is one fine dog. Question about cutting the strips. These chicken breasts now are so huge, would you cut across horizontally, then make vertical strips, 3/4" wide, as you say? You guess a deep fryer would ruin the whole concept? thank you. so you cut strips across the grain. haha! I'll try to round up the gallons of oil--I set the whole thing outside on the porch! Lovely dog, so glad he's better. My sweet old boy is 13, it's going to break my heart when he crosses the rainbow bridge. Going to try your chicken tonight, thanks!